These days toy kitchens range from pink 1940s retro to a state-of-the art outdoor play grill. While most of us parents are choosing play food settings with things in mind like durability and “just what do they mean by ‘some assembly required’?” We might be surprised to find out that this kind of food play may actually make our real food settings more fun, too. 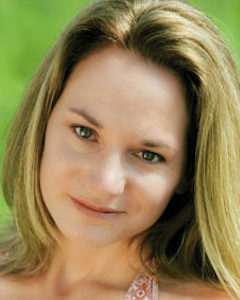 “Just why it is important to provide children with healthy toy foods to play with relates to the concept of “food familiarity,” explains Nutrition Education and Behavior Researcher Meghan Lynch, author of the recently published study, Playing With Food: A Novel Approach To Understanding Nutritional Behaviour Development. So, in the toy kitchen, where there’s no pressure for trying a bite and where you only have to pretend to do the dishes, you can actually reduce some of your child’s barriers to eating healthy foods while you are having fun. 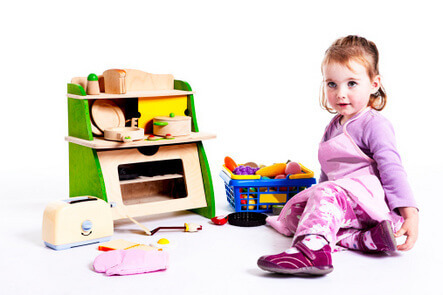 Toy kitchen settings are also a great place to start safely teaching basic cooking skills and kitchen safety. “In the safety of play settings, parents can familiarize children with new foods and behaviors by teaching children how to chop vegetables, stir pots of food, and correctly use the oven or stovetop,” Lynch continues. Children also mirror their parents’ cooking behaviors in these settings. In her research, Meghan Lynch observed children as young as three correctly using utensils, chopping and washing vegetables and stirring their “dinner” on the stove top. Choose only healthy foods for your child to interact with. Avoid branded junk food items that risk familiarizing your child with unhealthy preferences. Express your preferences for healthy items, and delight when “eating” them when at kitchen play with your child. Model healthy food behaviors, such as creating a balanced plate of food choices or not “overeating” during play meals. Use the time to help rehearse good kitchen safety skills with your child. As your child gets older, help her or him transition these cooking skills to the real kitchen. Many thanks to Nutrition Education and Behavior Researcher Meghan Lynch of the University of Toronto for her insights for this post.